March 3, 2016 /0 Comments/in Birth Injury /by Reiter & Walsh, P.C. Individuals with intellectual and developmental disabilities live and work within a larger community; it is important to remember that this population may require additional support in order to reach their goals. There are specific actions that communities as a whole can take to support these groups; more information can be found at the Michigan.gov website here. It is important to encourage an open and understanding discourse with and about members of the intellectually and developmentally disabled communities. We recognize that some of the challenges facing this population can include discrimination, low expectations, and limited opportunities. There are numerous resources available for those living with such disabilities, including the State Councils on Developmental Disabilities, the Administration on Intellectual and Developmental Disabilities (AIDD) and the National Association of Councils on Developmental Disabilities (NACDD). In fact, the Center for Disease Control’s Autism and Developmental Disabilities Monitoring Network estimates that about 1 in 323 children have cerebral palsy of a varying degree of severity. Furthermore, hypoxic ischemic encephalopathy (HIE), a commonly preventable brain injury often caused by medical errors, occurs in 1-3 per 1000 live births, according to research from the journal Newborn & Infant Nursing Reviews. I t is crucial that those who have been diagnosed with a developmental or intellectual disability due to medical negligence receive the proper care and support to allow them to live securely. The staff of Reiter & Walsh ABC Law Centers focus specifically on assisting those who have developmental disabilities. These may result from medical errors in the mishandling of a wide variety of health issues in mother and child. These include gestational diabetes, high-risk pregnancies, and errors in medication administration during pregnancy, birth, and delivery. We also handle cases related to birth injuries and trauma, cerebral palsy, and hypoxic ischemic encephalopathy (HIE). Reiter & Walsh, P.C. has demonstrated its commitment to the disabled community with outreach, support and scholarships. Our award-winning attorneys and in-house medical staff work closely together to evaluate cases; this combination provides our firm with a winning advantage in providing legal advice for your case. Please see our Verdicts and Settlements page to see some examples of our prior work for children with birth injury-related disabilities. 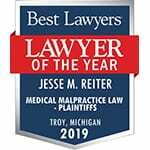 Reiter & Walsh ABC Law Centers has won numerous multi-million dollar settlements for those with developmental and intellectual disabilities due to medical malpractice, and we seek to assist your case as well. Please contact our offices here or via telephone at 888-419-2229 for a free case evaluation. We do not charge any fees until we win.